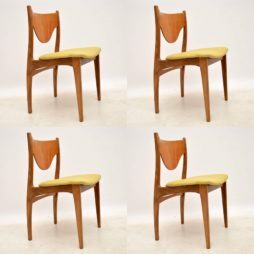 Mid-Century Chairs | Interior Boutiques – Antiques for sale and mid century modern furniture, french furniture, antique lighting, retro furniture and danish furniture. 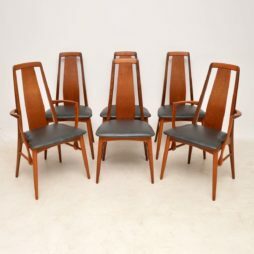 A beautiful set of six 1960s Niels Moller Rosewood model 79 dining chairs. A design classic and one of the more rare models to source. 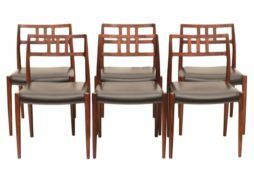 The chairs are designed for comfort with a form-fitting curved back offering excellent support across the centre of your back. 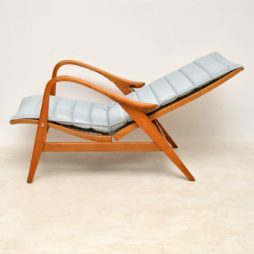 Model 79 is one of the most sought after chairs especially in Rosewood and leather. The chairs have been completely restored and repolished. The chairs have been re-padded and reupholstered in a sympathetic black leather as they would have been originally manufactured. 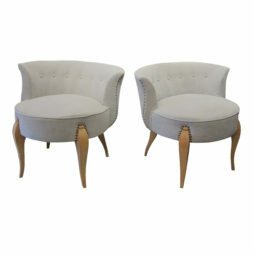 A 1950’s pair of Swedish occasional chairs, newly upholstered in a light grey fabric, easy to clean. 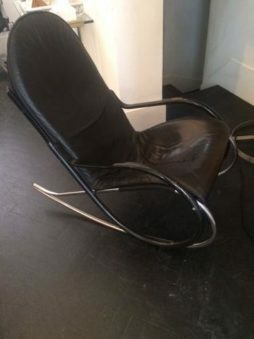 Stylish and comfortable rocking chair with black leather seat and back. An interesting mixture of materials has been used in the frame, it being partly ebonised bentwood and part chrome. By American designer Paul Tuttle. Ca.1970s. 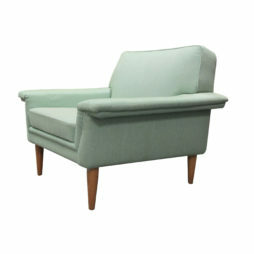 A Swedish mid-century single armchair with its light blue original fabric and oak legs. 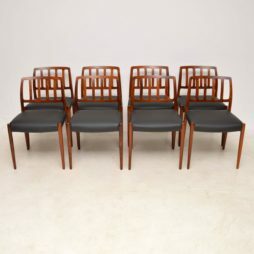 A stunning and quite rare set of four teak dining chairs, these were made by G- Plan in the 1960’s. They have a beautiful organic design, and are in great condition for their age. The teak wood has faded a little to a lovely light colour, there are very nice grain patterns all over, the frames are clean, sturdy and sound. 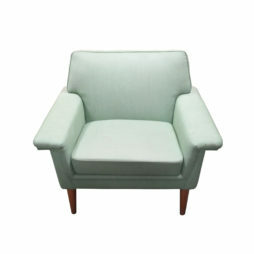 We have had the seats newly upholstered in a beautiful light green fabric. 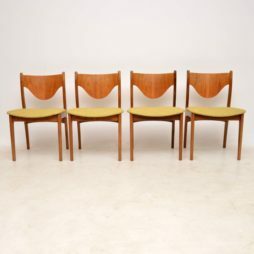 A beautiful set of six Danish vintage teak dining chairs, these are called ‘Eva’ chairs, they were designed by Niels Koefoed, they date from the 1960’s. They are of superb quality and are in excellent condition for their age, there is only some extremely minor wear to the frames here and there; overall they are very clean, sturdy and sound. We have given them a good clean and oiling, we have also had the seats newly upholstered in a top quality black vinyl that looks and feels just like leather. 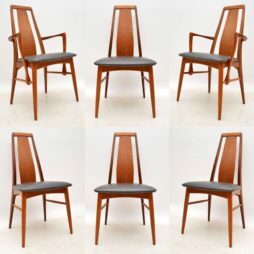 An absolutely stunning set of eight vintage solid rosewood Danish dining chairs, these are the model 83 chair designed by Niels Moller. The quality is pretty much the best you can get, these are extremely well made and built to last. 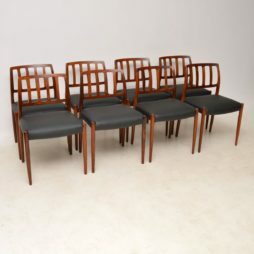 We have had them stripped and re-polished to perfection, they've all been completely re-upholstered in top quality black leather; the condition is immaculate throughout. 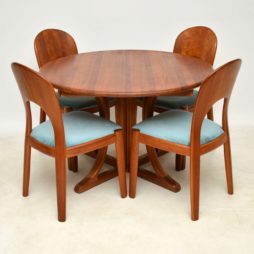 They are seen in the images set up around a stunning Rastad & Relling dining table which is available separately, seen listed under our other items for sale. 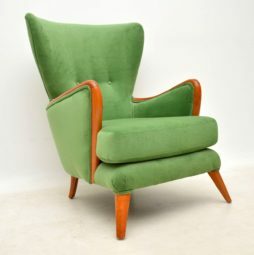 A beautiful and very striking and very comfortable vintage armchair, this was made by Howard Keith in the 1950’s. 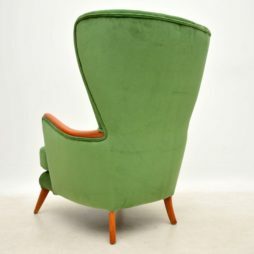 We have had it fully restored, the frame has been stripped and re-polished to a very high standard, and we have had it fully re-upholstered in a striking green cotton fabric. 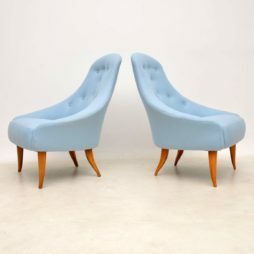 A stunning pair of vintage armchairs, these were made in Sweden in the 1960’s, they were designed by Kerstin Horlin-Holmquist as part of the Paradiset range. 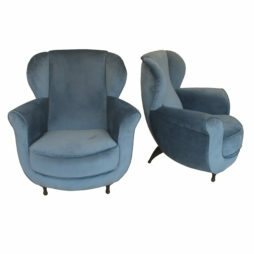 These are in superb condition throughout, we have had them newly re-upholstered in a high quality light blue wool. 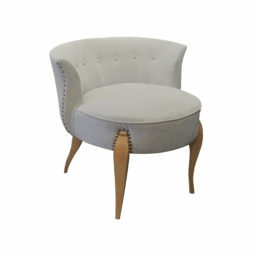 The shapely tapered legs have all been stripped and re-polished to a very high standard. 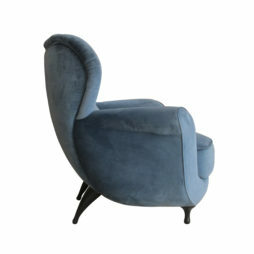 A pair of very large and comfortable armchairs by Moroso with original blue velvet fabric. Both chairs have the Moroso stamp. 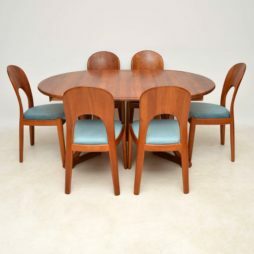 A stunning vintage solid teak Danish dining suite designed by Niels Koefoed for Koefoeds Hornslet, the chairs are called ‘Morten’ chairs. This dates from around the 1960-70’s, the condition is excellent and the quality is phenomenal. 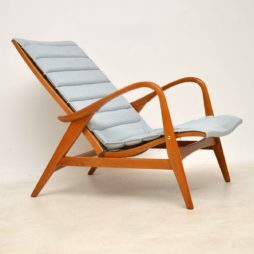 This is solid teak throughout, with a sculptural design to the chairs and the table. 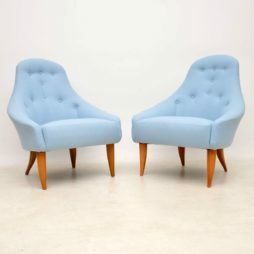 The chairs are all very clean, sturdy and sound, we have had the seats newly re-upholstered in a light blue velvet which is unbelievably soft to the touch. The table is also clean and sturdy, with only some very minor wear here and there. This comes with two additional leaves to extend the surface area.